Kit floor mats Rubber Honda HR-V 3 Door (1999-2006) high quality and manufactured with the measures and specific forms for your Honda HR-V 3 Door (1999-2006). Include technology Free This software to avoid any kind of rubber smell inside the car. 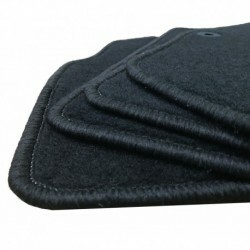 This product includes a kit of four rubber mats for Honda HR-V 3 Door (1999-2006) front and rear. Product in stock. Delivery in 2-4 days. Kit consisting of four mats for Honda HR-V 3 Door rubber (front and rear). Manufactured with technology FreeSmell that prevents the rubber smell inside the car. Rubber high-quality and thickness to flange to avoid the dirt from sliding to the carpet of the car. All rugs are made to measure. The pictures are generic in that you can appreciate the quality of the mat. You will receive in your home a few mats of rubber with measures and shape exactly the same as those of your Honda HR-V 3 Door (1999-2006) and with the quality of the photos. Rubber mats for Honda HR-V 3 Door black in color, thick and flexible hold easily the dirt, mud and water preventing be transferred to the upholstery of the car. Ideal for use in adverse conditions. Its design allows to collect the water, mud, sand and dirt, avoiding that it soaks through to the upholstery of the vehicle. Manufactured under the strictest standards of quality: high thickness and good quality of rubber. Do not bend, they are waterproof, do not wrinkle and do not crack. Average length of item: 15 years. From this date, the rubber will lose properties and it is advisable to change them. The purpose of the floor mats rubber Honda HR-V 3 Doors is to offer the best possible protection for the floor of your vehicle and avoid this mess. Any doubt please contact us, specialists in floor mats rubber tailored for Honda HR-V 3 Door (1999-2006).